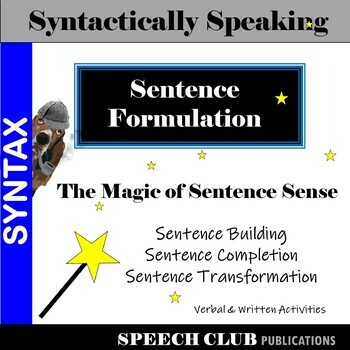 The Magic of Sentence Sense: Sentence Formulation - Sentence Cloze - Sentence Transformation is a set of materials designed to facilitate flexibility, comprehension and use of syntax in verbal and written communication. The lessons provide practice in assembling, reading, writing, illustrating and transforming sentences. Writing and reading are combined with illustration to encourage focus on comprehension and the encoding of internal visual representation. Illustration fosters careful reading, attention to detail and assists in monitoring progress. Silly sentences help to avoid predictability, provide motivation and encourage humor. Tasks such as sentence building, identifying parts of speech, illustrating, sentence cloze and sentence transformation provide practice in analysis and synthesis, oral expression, decoding and comprehension.